The first of three Par 5’s on this nine holes. 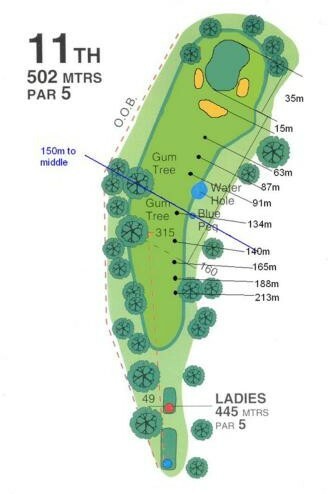 This 502m Par 5 is again a three shot Par 5, the tee shot is straight forward with the player looking to aim down the centre to left side of the fairway. The second shot has to negotiate the canopy of the trees that encroach from the sides of the fairway around 160m from the green. For the long hitters looking to reach the green in two, the bunker to the left of the green is not a bad miss.